I get recommendations on restaurants all the time from various sources – friends, the Post food critic’s weekly chat, articles I read, etc. I’ve had scattered approaches to keeping track of them. I used to email them to myself. Then I tried keeping a document in Google Docs. Inevitably, I’d end up eating at the same places because the information wasn’t in the best form when I needed it. Now I’ve shifted to using Google My Maps. I created a map of Places to try. This map includes restaurants, hotels and other places I want to try around the world. In to each location, I copy in the notes that led me to put it on the list. It’s a great way to keep things organized. Now I can just zoom into where I’m going and I have easy access to where I want to go. For locations in the United States, I can also access the list from my cell phone, sorted by distance from where I’m at. The side benefit is that with Google Maps user-created content search, that information is available for everyone to search. This is especially useful when the places I add are new and not in the Google Maps business database (as they often are for restaurants in the D.C. area). 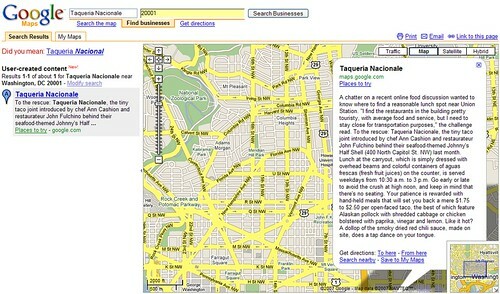 If you search for Taqueria Nacionale in 20001, currently the only result is my “to do” with its notes. It’s a much better experience than a no results found page. This entry was posted in google, local search, maps, web 2, web 2.0. Bookmark the permalink.